Located on De La Commune in Old Montreal with 1-bed 1-bath, this 790 sq.ft. condo features telescopic windows, high ceilings and exceptional building amenities. This bright fully-furnished unit is chic and modern and includes all the creature comforts. Hardwood floors throughout, the spacious living area features a comfortable den, 4 person dining table and fully-equipped kitchenette complete with breakfast bar. Big telescopic windows in both the living area and king-size master bedroom offer great views of the St-Laurence River and the designer bathroom features spa-like fittings. 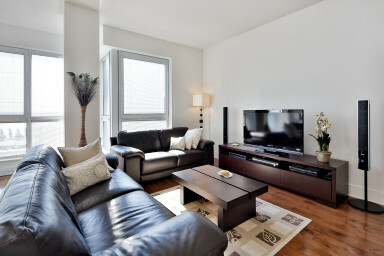 For your next apartment hotel in Montreal, Simplissimmo’s got you covered! The modern Solano project completed construction in 2013 and truly understands the urban lifestyle. Each of its 124 units is unique with an attention to both comfort and functionality. Offering remarkable views of the St-Laurence River and its marina, guests staying here will have access to the state-of-the-art gym, sauna and indoor swimming pool as well as the shared rooftop sundeck, outdoor swimming pool and lounge. With an elegant lobby foyer and the inner-courtyard garden, the Solano is urban living done right. The Old Port of Montreal stands as the St-Laurence River’s gateway to the city. With millions of tourists visiting every year, the Port offers many exciting attractions and activities. For year round rentals such as bicycle, boat and skating as well as the Montreal Science Center and outdoor events visit the Promenade. Eat at popular restaurants like Le Bremner or drink in style at Terrasses Bonsecours. For your next stay, find out why the Old Port of Montreal is so special!